It’s rare to be the first to do something, and continue to do it well for hundreds of years. To find inspiration around you, and reinvent yourself, it takes a certain discipline and dedication, to grow and evolve, even if it’s uncertain that you will succeed. This is what the winemakers of Codorníu Cava have done, by expanding their selection of Spanish sparkling wine in two directions, single vineyard and fresh modern wines, the brand is elevating, modernizing, and adding to their already impressive range of Cava. Equally as rare, Codorníu visited Los Angeles recently, to unveil this two-pronged approach to the art of celebration. Over lunch at Ray’s & Stark Bar, the charms of these new players in their Cava lineup were displayed, with a presentation by Matthew Kaner of Bar Covell and Augustine wine bar fame. From the fresh Anna Cavas to the pedigreed Ars Collecta, there is an OMG moment, when you realize that the company has been making wine for 457 years, and pioneered the use of the traditional method for making Spanish sparkling wine, producing Cava for the past 145 years! You realize that while the company is steeped in history, it’s looking to the future, offering value and quality. For Codorníu, success is forged in the crucible of family and history. In 1659, Anna Codorníu, heiress to the Codorníu winemaking family, married winemaker Miquel Raventós, and ignited a wine dynasty that continues to this day. Codorníu Raventós is the oldest family business in Spain, continuously producing wine since 1551, for 457 years. Channeling tradition with innovation, Josep Raventós first launched Spain’s version of sparkling wine in 1872, blending the traditional white grapes for Cava (Parellada, Xarel-lo, and Macabeo) into a cuvée that was produced in the same way as French Champagne, the traditional method of secondary fermentation. This revolutionized sparkling wine production in Spain, with Codorníu the driving force, elevating their cuvées with the addition of Chardonnay and Pinot Noir, another first for Spanish sparklers. Today, Codorníu is rolling the dice once again, betting that Cava lovers will want more specific types of sparkling wines for different occasions. ​Produced at Codorníu’s flagship winery, Sant Sadurní d’Anoia or better known as the Cathedral of Cava, their extensive range of Cava wines are patiently nurtured from the vineyards where the grapes are grown to the cellars where the bottles are aged. Freshness and personality define the different bottlings. With seven different versions of sparkling wines, the aim is to be a Cava for all reasons, everyday to special occasion. The Ars Collecta represents the best of Codorníu Cava, single vineyard blends of the highest quality, that are terroir-driven. A decade in the making, these wines were first released in 2016, with Codorníu bucking tradition by incorporating three different varietals, from three different landscapes and three different states of the Cava Appellation. Chardonnay comes from Finca La Pleta vineyard in Segrià, shallow soils and extreme Continental climate conditions which concentrate the aromas and flavors in these grapes; Pinot Noir comes from Finca El Tros Nou vineyard in Conca de Barberà, “licorella” soils (clay and slate) and lots of stones, a Mediterranean-Continental cool climate with coastal breezes that allow the grapes to slowly ripen; and Xarel-lo from Finca La Fideuera vineyard in Alt Penedès, limestone gravel soils and Mediterranean day-night temperature swings that promote aromas, acidity, and structure in the grapes. Wind is an important aspect, three winds (Xaloc, Mistral, and Tramontana) shape the terroirs, breathing what they believe is the “spirit and temperament” into the final wines. 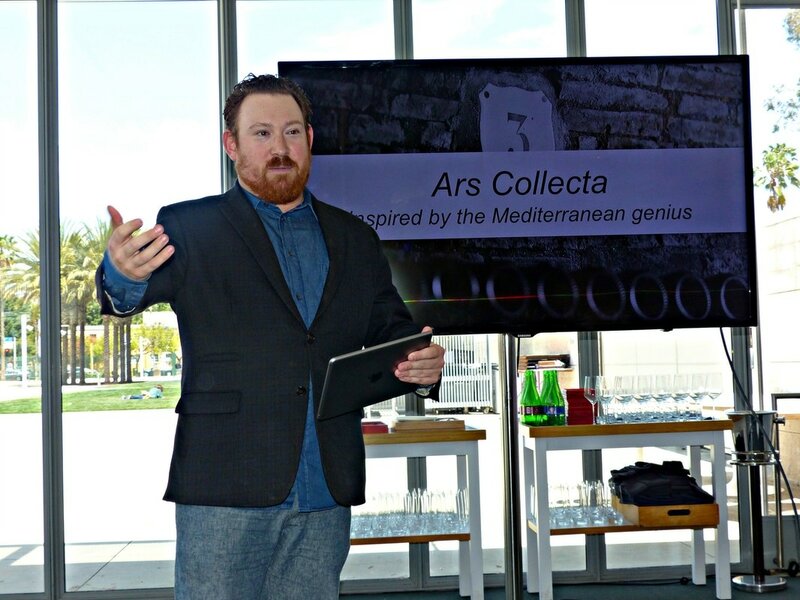 Crafted in a smaller winery within the winery, Celler Jaume has been refashioned as a sort of experimental laboratory for their “mad Mediterranean genius”, where the Ars Collecta Cavas, limited editions and numbered bottles, are a work in progress, a gamble for the future of the brand. The Ars Collecta Jaume Codorníu Gran Reserva Brut 2012, 42.5% Chardonnay, 42.5% Pinot Noir, and 15% Xarel-lo, is intense and complex, aromas of ripe fruit (peach and melon) dance with savory notes of nuts, toasty bread, and yeast, the creamy mousse and long finish define its elegance. This Gran Reserva Cava, with only 20,000 bottles produced, has a more classic, savory Spanish Cava profile. Only the best grapes from the oldest vineyards make the cut, in this homage to Jaume de Codorníu, the founder, which retails for $50. The Ars Collecta Finca La Pleta Gran Reserva Brut 2007, 100% Chardonnay, is the smallest production, only 300 bottles made, and one of the three single vineyard bottlings. Night harvesting of the grapes and gentle handling throughout the winemaking process ensure an elegant wine. The delicate mousse releases intense aromas of stone fruit and white flowers, a creaminess on the palate along with the texture makes for a very nice mouthfeel, with a long finish. This wine is a testament to what Chardonnay brings to sparkling wine, an elegance that is inherent in the grape, and defines the wine, which sells for $90. The Anna de Codorníu “lifestyle” Cava collection are value priced wines that are designed to be a part of everyday life, from aperitif to dessert wine. Beautifully wrapped in festive packaging, they are fresh, fruity, and effervescent Cavas whose easy appeal and distinctive personalities make them stand out from the crowd, and retail under $15. 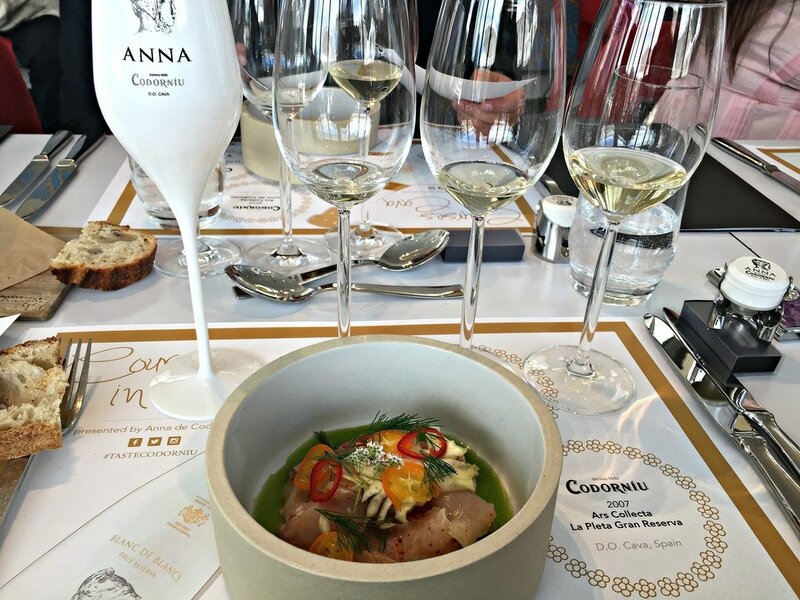 The Anna de Codorníu Blanc de Blancs Brut Reserva, 70% Chardonnay, 15% Parellada and 15% of both Xarel-lo and Macabeo, is fresh and crisp, with good acidity and fine, lively bubbles. Chardonnay is blended with the three traditional cava grapes, and aged for 15 months on its lees in bottle, which gives the wine texture and brioche notes. Aromas of citrus, apple, pineapple, and buttered toast swirl in the glass. Smooth and creamy on the palate, it tastes of yellow apple and citrus, which lingers on the finish. This delicate bubbly, perfect on its own or a versatile partner with food, really popped alongside the Yellowtail Crudo with Kumquats and Cucumber Aguachile. The Anna de Codorníu Brut Rosé, 70% Chardonnay and 30% Pinot Noir, is refreshing, with captivating aromas of strawberry and cherry, and a hint of green apple carried up through the effervescent bubble stream. Well balanced, with crisp acidity keeping the richer red fruit flavors from weighing it down, it’s an elegant wine that is extremely food friendly, and was served with a Chicken Breast with English Peas and Spring Salad, its freshness would be a great counterpoint to many other foods. The Anna de Codorníu Dulce Anna, 70% Chardonnay, 15% Parellada, and 7.5% of both Xarel-lo and Macabeo, is classified as a sweet cava, but it is more fruity and round, with that same freshness that seems to define the Anna cavas, and really not that sweet. Designed to accompany desserts and cheeses, its balance makes it delicious to drink on its own as an aperitif or made into a cocktail. Aromas of white flowers and white peach dance on the fleshier body, kept fresh and vibrant through crisp acidity. It was a revelation when served alongside the Passion Fruit Mousse with Honey Lavender Ice Cream! Next time you’re ready to pop the cork, try the world of Codorníu Cavas, most are widely available, except for the Ars Collecta, which are a limited production, while the Anna sparklers are affordable enough to enjoy daily.